NEW HAMPSHIRE primary voters have long taken pride in subjecting presidential wannabes to a long and thoroughgoing scrutiny — vetting the candidates on their political stands, grilling them at innumerable town hall meetings, assessing their demeanor on the campaign trail. White House hopefuls held themselves to a high standard of civility, or they didn't win the first-in-the-nation primary. By handing a victory to Donald Trump in this year's primary, New Hampshire's voters may have just blown up that long-nurtured credibility. In previous election cycles, New Hampshire voters went (twice) for Republican John McCain, an affable and self-effacing war hero. In 2012 they backed Mitt Romney, a man so averse to bad language that his idea of swearing is a G-rated "H-E-double hockey sticks." On the other hand, when Bob Dole, asked on TV in 1988 if there was anything he wanted to say to his rival George H. W. Bush, snarled, "Tell him to stop lying about my record," his bitterness seemed to ratify New Hampshire's decision not to support him. This time around, the winner of New Hampshire's GOP presidential primary is a vulgar and loudmouthed egomaniac, as ignorant of public affairs as he is gifted at stoking anger and xenophobia. 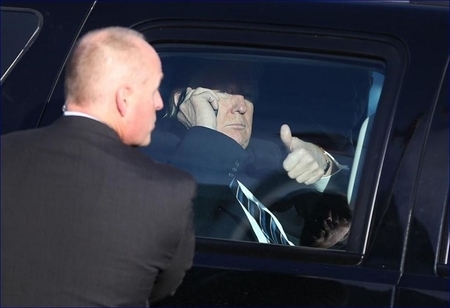 Trump led every poll of New Hampshire Republican voters since last summer, nearly all of them by double digits, so his first-place finish on Tuesday, with 35 percent of the vote, came as no surprise. But it was a grievous confirmation of how far the Party of Reagan has drifted from its moorings. Granted, there are plenty of caveats. Nearly two-thirds of the vote didn't go to Trump. Under New Hampshire's open-primary rules, many of those who took a Republican ballot on Tuesday presumably weren't Republicans. And victory in the New Hampshire primary is no guarantee of eventual nomination. 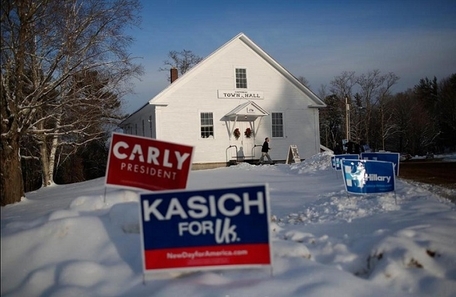 A voter leaves Canterbury Town Hall after voting in New Hampshire's presidential primary. All the same, New Hampshire voters have just given their imprimatur to a Republican candidate who embodies a crude, unfiltered, uninformed solipsism — a demagogue far removed from everything thoughtful and honorable in the Republican Party's traditions. After losing the Iowa caucuses to Senator Ted Cruz, Trump could have moderated his ugly and reckless campaign style. Instead he doubled down, using the F-word and other lewd language at campaign rallies, exuberantly embracing the torture of terror suspects, and repeating at every turn that Iowa's results were fraudulent. New Hampshire's voters have just rewarded those grotesqueries, bestowing on Trump his first official win of the presidential season. In so doing they have stained, perhaps permanently, their reputation for electoral discernment. Shocking, yes. Looming dictatorship? No.